A majestical WOSOSI Whanau Wananga! 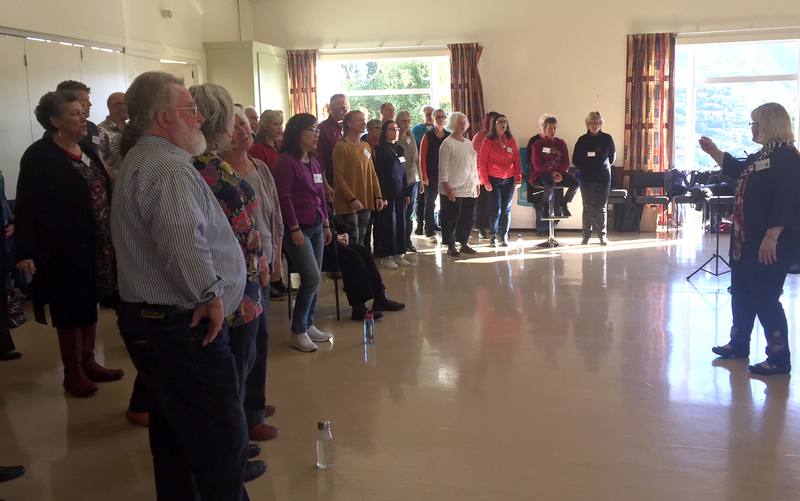 The Sing With WOSOSI workshop on 14 July was an amazing afternoon of beautiful singing, wonderful teamwork, fabulous baking and warmly and openly connecting with our visitors and with each other. THANK YOU!! Thank you to our visitors for showing up in a new space not knowing what to expect - and giving it their all - and being so receptive and being just great good fun, we hope you enjoyed it all as least as much as we in WOSOSI did! A huge warm Thank You to every WOSOSI volunteer in the various crews (and Linda!) who helped the event run seamlessly and on time, I can't use enough celebratory adjectives here, the workshop was a success because of you, because you invited your friends to come join with us, because you brought delicious treats for afternoon tea, because you served tea with a smile or pulled tables around or cleaned up or gave out name tags. Your spirit and enthusiasm and heart shone through the whole event. Thank you to Pam and Kaye for a beautiful selection of songs to sing and the beautiful teaching of them. Thanks to Ian for being an expert MC and for selling CDs. Thanks to Brian, Kaye and Belinda for a moving and wholehearted mihimihi to open the afternoon and welcome all to the event and for setting the tone and intention of the afternoon - and for also closing the event in a similar vein. Thanks to Liz for much practical advice. Thank you Charlotte for the pineapple. For those who couldn't be there, here's a quick summary. We had 20 Wososi whanau and 27 visitors. There were six men visitors in addition to Brian, Spencer, Ian and David and together they gave great resonance and depth to the bass end of our sound. When we cranked up to full volume it was a wonder the ceiling didn't rattle, man it was powerful! After the warm up we launched into a rousing version of Duša moja (apple-cheeked Balkan one, Slavic mountains at our side!). One of the standout features of the afternoon was how quickly the visitors picked up all the new material because we were straight away on top of Lo Yisa Goy (Israel) and then the French song Je Chante. We then immersed ourselves in a moving and soulful mashup of affirmations from the various spiritualities, the Peace Prayer Mandala, with its bass line drone Om Mani Padme Hum as the coathanger from which all the other phrasings (American Indian, Hindi, Islam, ) were draped - many people stepped into the middle of the circle to sample the wraparound sound bath of this beautiful piece. Then Kaye stepped out front to gently lead the deeply moving Hutia Te Rito and the atmosphere in the room was totally magic. And yes the Oscar for Sound Effects goes to our Whisperers for quality whooshy whispering from the rear! After a lovely long refreshing chatty break for yummy afternoon tea (thank you bakers and sandwich makers), we were straight into the funky jazz reggae groove of Watcha Talkin' 'Bout?! and we rattled that ceiling. And then straight on from that into the African song Emakayeni. Most of us in the front row got our dance groove on to that one. We wrapped up with a five minute improvisation soundbath which was a first-time plunge for some of our visitors, and a moving experience for many. We finished with a very successful revisit of each of the magical songs learned during the afternoon. The room was bathed in warm sunlight for most of the afternoon and I think we all walked away from St Luke's feeling we'd treated ourselves to (and been wrapped in) something very special in there. It was a majestical WOSOSI Whanau Wananga! Hope we can do this again soon. Here’s a photo of us I took quickly on my phone.